Tagline: Don’t plan on wearing white after today, because we’ll all be dead. Synopsis: The Alien Invaders are back and this time they’re prepared. With the humans caught off guard we soon find the Human race on the verge of extinction, again. Memorable Scene: The Alien’s have decided to call Microsoft’s tech support about their computer virus. Once they finally get through they’re placed on hold forever and then transferred to a call center in India. After a long heated exchange between the Alien the young Indian gentleman, the Alien informs the customer service representative that India is now first on his list of countries to destroy. That is once their computer system is up and running. Plot: Its one year later on August 30th and humanity is still in the process of cleaning up and coming to grip with the fact that we are not alone. Though many are celebrating our underdog win over the alien invaders. There are those who have warned humanity about the need to stay vigilant. These small groups of international leaders have been labeled “paranoid” for their views. Their constant bell ringing about the possibility of a second invasion seems to fall on deaf ears due to they’re lack of coverage by the mainstream press. It seems the media is a little preoccupied with President Thomas Whitmore’s (Bill Paxton) affair with his communications director Constance Spano (Margaret Colin). He quickly fell from hero to tabloid villain within a few months. Though the President’s not the only Independence Day hero whose life has taken a drastically different direction. Former Air Force pilot Steven Hiller’s (Will Smith) life seems to be changing as well. Hiller is in process of filming a major motion picture based on his life and experiences with the Aliens, playing himself. Over night, Steven Hiller went from pilot, to hero, and now movie star. David Levinson (Jeff Goldblum) also made some impressive moves in his life after his pseudo celebrity status as a scientist. He was asked to join a team of real scientists on a secluded island who were experimenting with dinosaur DNA. No one has heard from Levinson since his trip. The world will soon need these three men once again. 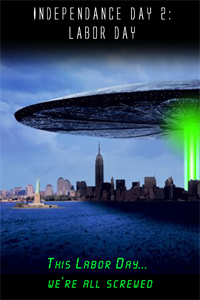 On Sept. 2nd multiple Alien warships are witnessed hovering over every major city. The Invaders seemed poised for a second attack and this time they came prepared. They’ve been studying us for the past year. Waiting in the shadows for the perfect time to strike and the President’s affair seemed to provide the perfect distraction. Throw in the long holiday weekend and you have yourself a perfect storm of events. Most news stations were so relentless with their coverage of the President’s affair that they didn’t even bother to report the massive alien ships floating above the cities. Even when people finally realized what was going on they were powerless to stop it. People from coast to coast cried out for Captain Steven Hiller to come to their rescue once again, but due to his binding contract with the studio, he wasn’t able to stop filming for fear of a lawsuit. Even David Levinson was nowhere to be found in this time of crisis. Sadly, there were no other cable repairmen turned computer hackers with his skill level left in the world. The Alien invaders did update their Norton Anti-Virus software as a precaution, just in case Levinson showed up. Once all of humanity’s options had run out, the Invaders destroyed every major city once again. Then, they seized control of the population. All of humanity was forced to serve their Alien masters and work in Alien labor camps. I have seen Independence Day 1 and was my favourite movie, so i can’t wait when it comes to the cinema.